A man was killed at a girl's birthday party in Mexico attended by thousands after her parents' video invitation to "everyone" went viral on social media. The man died after stepping into the path of a galloping horse during a race in honour of the girl's 15th birthday. Local media said the 66-year-old owned one of the horses taking part in the amateur race. About 1.3 million people earlier vowed to attend the party, which also featured local bands and food. In a video message recorded earlier this month, Crescencio Ibarra announced that he would be organising a 15th birthday party for his daughter Rubi on 26 December in La Joya community, central Mexico. "Hello, how are you? We invite you this 26 December to the 15th birthday party of our daughter, Rubi Ibarra Garcia," Mr Ibarra said while standing next to Rubi and his wife Anaelda Garcia. He then went on to announce that the winner of the horse race to be held as part of the event would win 10,000 pesos ($490; £390). One of those drawn by the invite, and the horse race in particular, was Felix Pena of the local Coyotes Negros (Black Coyotes) stables. Mr Pena told local broadcaster Hora Zero that he was entering his horse, Oso Dormido (Sleeping Bear), in the race and that he expected it to win. "I'm not doing it for the [prize] money, I'm doing it for the fame and the glory." In a video taken of the race he can be seen rolling in the dust kicked up by the horses and then lying unconscious on the ground. Emergency workers said he died on the way to hospital. It is not clear why Mr Pena, who regularly raced horses, stepped into the path of the galloping animals. Some bystanders said he may have misjudged the distance as he tried to cheer on Oso Dormido. Another person who also stepped into the path of the horses broke a leg. Police said apart from the accident during the horse race, the party went off peacefully. 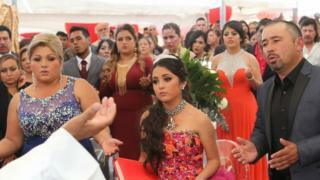 Throwing a large party for a girl's coming-of-age is not unusual in Mexico, but Rubi Ibarra Garcia's party was unique in the attention it drew. Mr Ibarra's message was posted publicly on Facebook and was widely shared on social media, prompting countless memes and imitations. Mr Ibarra later said that the idea had been to invite neighbours and friends only, but promised that he would not turn anyone away. On the day, thousands of people showed up and relatives had to move away an army of waiting reporters so Rubi could attend an open-air Mass. Dozens of tents and tables filled with food were prepared for those who made the journey. They were met by Rubi, who looked serene despite the crowds, wearing a fuchsia dress and a tiara. Her father was at one point exasperated by the media and threatened to end the party if reporters did not give his daughter some space.